Now Slack-ing Off Is Encouraged! 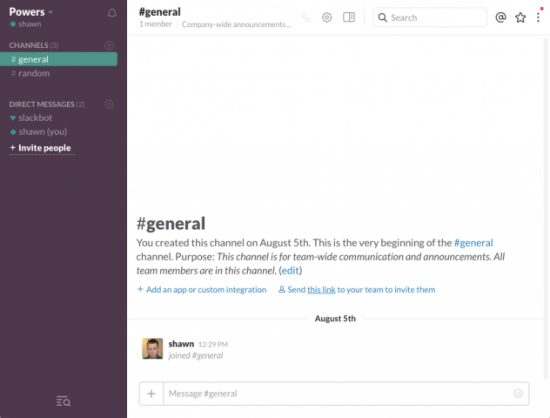 If your company hasn't already chosen to utilize Slack, it's probably only a matter of time. For anyone who has been around IRC before, Slack might seem like a total ripoff. I'll be honest, when one of the companies I work for starting using it, I wasn't impressed, because I could do all the same things with IRC. I was wrong—at least partially. Slack is certainly an IRC-like communication tool that is perfect for communicating with other people in an organization. What makes it special is its ability to integrate with other services so well. Things like Google-based authentication for single-sign-in is simple to configure. It also has a very robust API, so you can integrate countless third-party tools into your Slack environment. Some of them are silly (like adding GIPHY so you can insert animated GIF files into your conversations), and some are incredibly useful (like triggering remote scripts to give you real-time feedback in a chat window). Plus, if you're like me and you can't do without IRC, it's possible to integrate IRC into your Slack experience using Sameroom. Truly it's the ability to integrate with other services that makes Slack so powerful, and its ease of use makes it popular for companies, even when the employees aren't all IT folks. Check it out today if you're looking for a great way to communicate with groups of people in your life that might not appreciate the nuances of IRC!